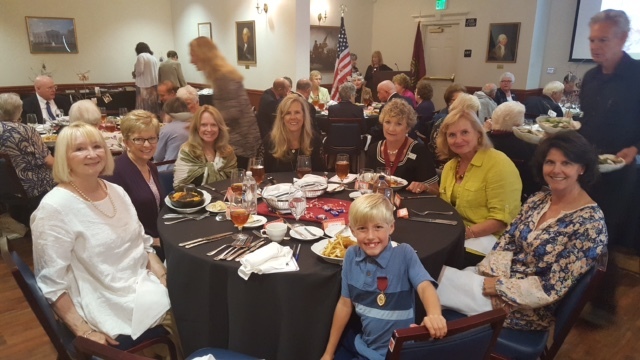 Our 2017 Annual Meeting attracted 45 members, prospective applicants and guests, some of whom travelled from Sherman Oaks and Palm Springs. 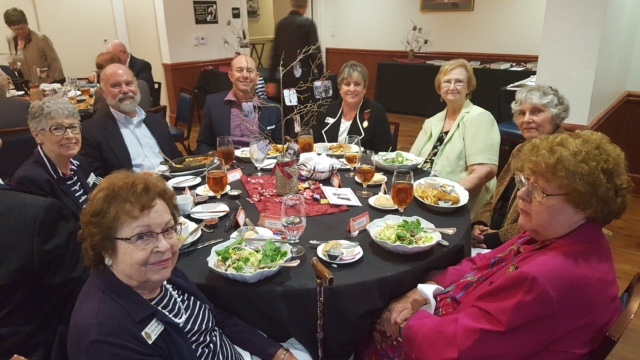 We began with an opportunity to socialize – renewing acquaintances with old and new friends – and, later, conducted company business. 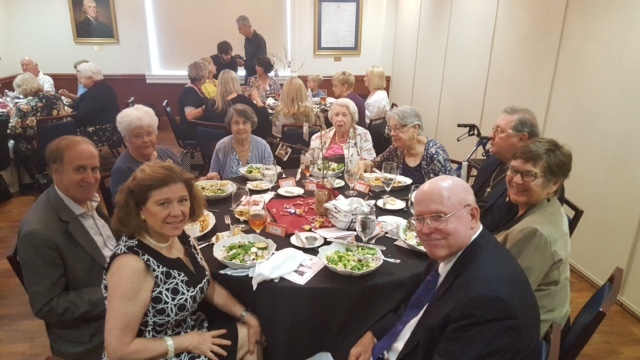 KC’s talk explored numerous sources that can further genealogical research to help individuals identify a qualifying ancestor in order to join the Jamestowne Society. In addition to sources, she touched on planning your research, sources to help you find sources, and common research pitfalls in genealogical research and how to avoid them. Acknowledging the scoping guidance provided on our website for what criteria a qualifying ancestor must meet, KC provided some historical and social context about the first landing ancestors – did you know it included free Africans and a Persian? 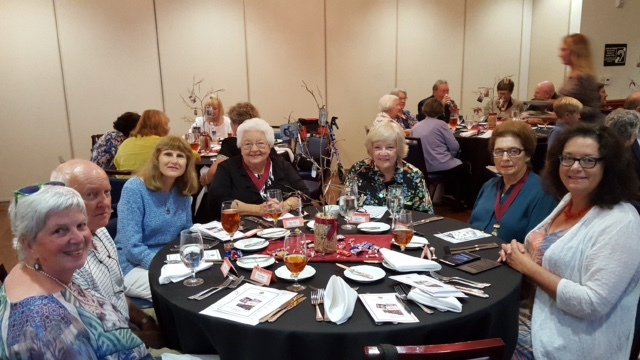 After giving a live demonstration on tools that can aid in finding resources and genealogical information relevant for discovering Jamestowne ancestry, KC showed the group how to find the original source documents, and provided several websites that organize the information by person rather than by chronology or other methods common to historical information. 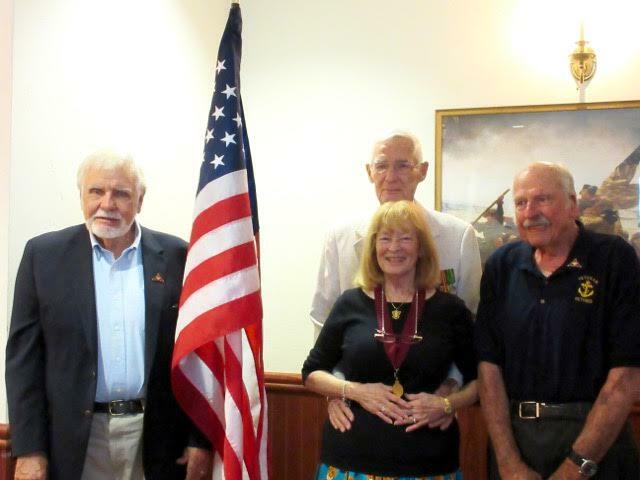 She provided an overview of many published works that are helpful in Jamestowne genealogical research, including several that may help link families from the early 1900s back to the qualifying period, and discussed the benefits and drawbacks of each. These included tax records, will abstracts, and legal proceedings in addition to books that provide a wealth of context for relations with the Native Americans as well as the meaning and traditions surrounding land purchase, transfer, and concepts of ownership. An anthropologist by training, KC highlighted information available from archaeological digs from the 1930s onward and the surprising insight they can provide to those researching their Jamestowne ancestry. Similarly, she provided insight into the corporate culture of the Virginia Company of London to illustrate the kind of information that may be found in the business records. Governor Scarlett Gathings Stahl Shepherd reported on her May 6 marriage to Historian James Shepherd, our table at the recent Genealogy Jamboree in Burbank that was attended by 600 and her participation in the 400th anniversary commemoration of Pocahontas’ burial on March 21 in Gravesend, England. 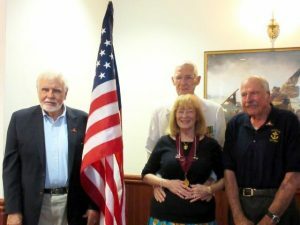 She conferred the Society’s new veteran recognition pins on Lt. Col. James A. Shepherd (USMC retired), Chief Petty Officer John E. Cahoon (US Navy retired) and Jim McCall (USMCR). Following the meeting, Membership Chair Marty Sommercamp and other members assisted several who are preparing their applications. 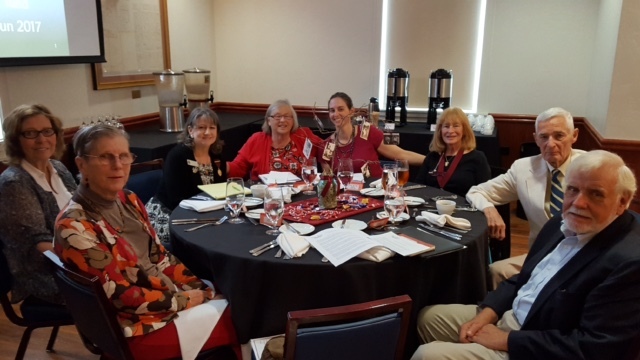 This entry was posted in 2017, 2017 Annual Meeting, First California Company, Genealogical Help, geneaology, Jamestowne Society, Jim Shepherd, KC Reid, New Members, News, Scarlett Gathings Shepherd, Scarlett Stahl, Uncategorized, Updates. Bookmark the permalink.